Um…do you ever get all excited about a picture of a recipe, only to read the ingredients and realize you totally misinterpreted what you saw in the picture? 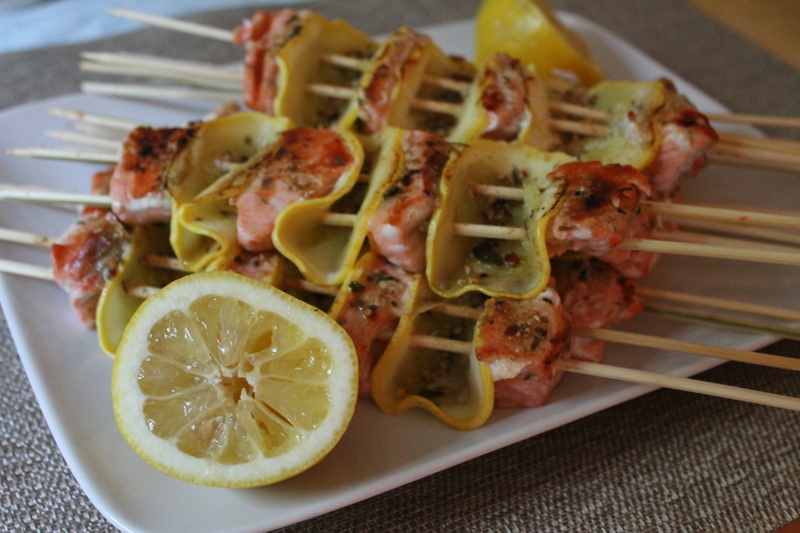 I found a beautiful picture of salmon kebabs this week and did a little dance about how pretty the squash medallions looked with the salmon and how interesting the combination was…only to realize the original recipe had thinly sliced lemon threaded between the chunks of salmon, not yellow squash. Oops. But since I had two beautiful yellow squashes from the CSA this week, I forged ahead anyway! And let me tell you, these kebabs were perfection! Once upon a time I thought there must be a holy grail of chocolate chip cookie recipes out there somewhere. I thought that when I found the perfect one, it would fulfill all of my chocolate chip cookie needs, forever and ever. 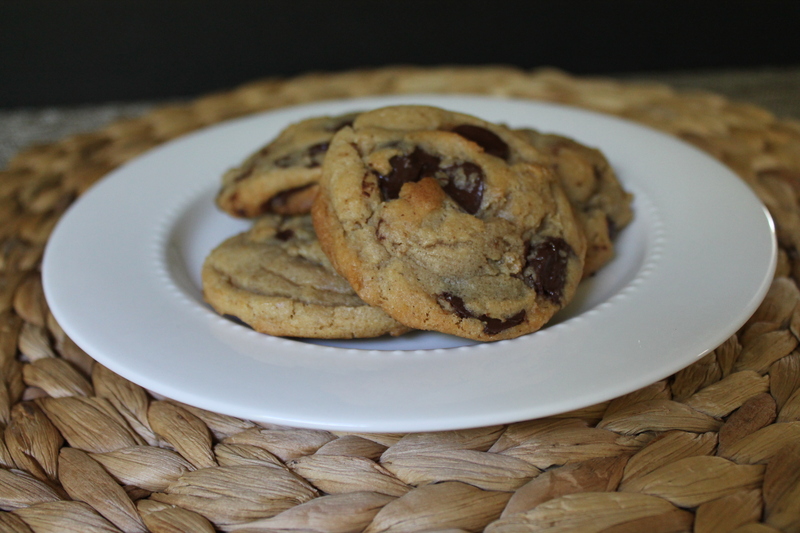 There must be about a million ways to make a fantastic chocolate chip cookie, each one more delightful than the last. I thought I had hit pay dirt a few years ago when I made cookies with brown butter for the first time, but holy moly, let’s go crazy and add bourbon, shall we? This cookie is rich and buttery, accented by a slightly tangy caramel flavor left by the bourbon as it baked off. It’s full of dark, bittersweet chocolate chunks that melt in the oven and stay melty until you eat every last crumb. You will not be able to eat just one of these! I can’t wait to make them again…and I highly suggest you go buy some bourbon and whip up a batch as soon as possible! I looked in my fridge this week and almost had a panic attack. It has finally hit me…the overwhelming overabundance of veg. You know, when I told my friends that I was joining a CSA for the summer, anyone who had ever done a CSA before me immediately commented that although it was a fun experience, there was just too much produce to manage. I scoffed. I am a vegetarian! I eat a lot of vegetables! I’ll definitely be able to keep up. I admit it. I have called friends and neighbors to pawn vegetables off on them. I have let fruit go bad on the counter…good food has gone to waste. But there is just so much produce! CSA week 12 brought a humongous melon, corn, tomatoes both large and cherry, green peppers, a yellow squash, green beans…plus I was sitting on several weeks’ worth of potatoes, more and more corn, grapes, and even a dreaded cucumber. Sheesh. And (don’t judge me) I also had some veggies from the farmer’s market hiding in there. Hey, sometimes a girl just likes to choose her own squashes and tomatoes! 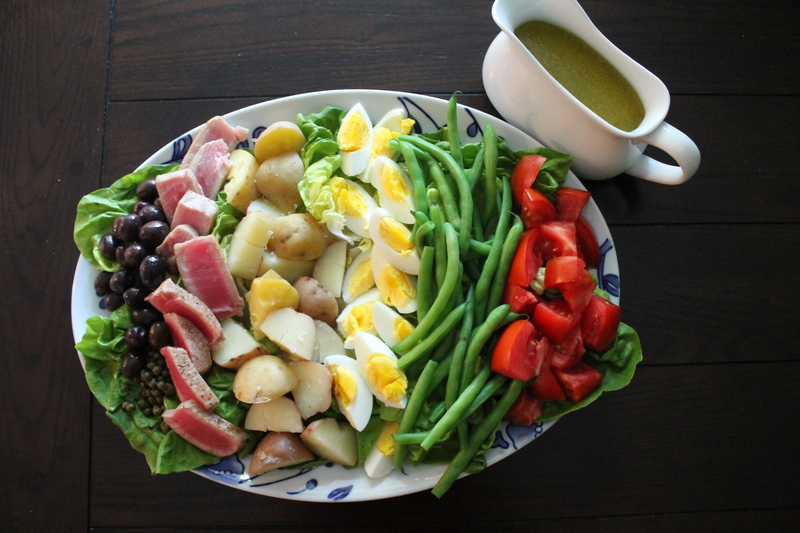 Anyway, let’s just review our grocery list here and count ourselves blessed that the French gave us salade Niçoise! We can use up all those potatoes and green beans! We can make a serious dent in the tomatoes! Add some olives and capers and beautiful seared tuna, and we are seriously on our way to an amazing salad! 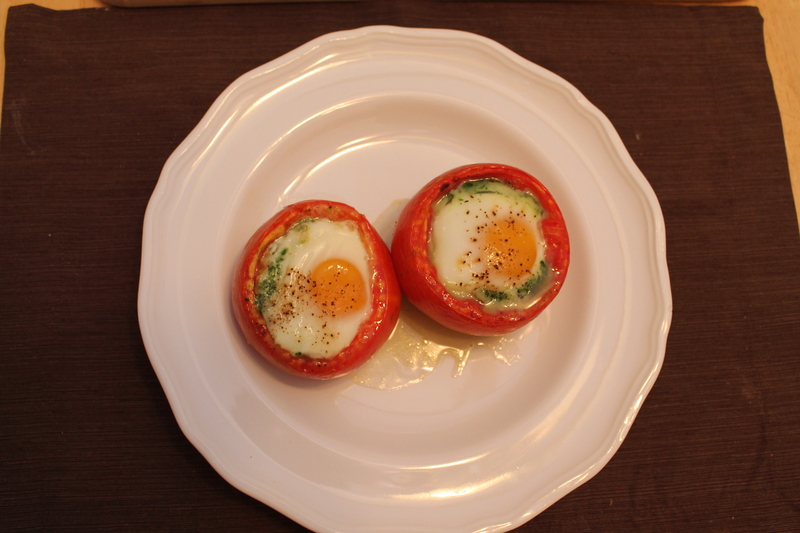 I got several big, beautiful tomatoes last week in my CSA box…but then I went out of town before I could use them! I was afraid they would go bad sitting on my counter, and I would return home to a sticky, moldy mess—plus no tomatoes!—so I stuck them in the fridge. FYI: Don’t put tomatoes in the fridge if you can help it. It makes them mealy and steals away their big, fresh flavor. I didn’t do this, but Dave and I agreed that next time we have stuffed tomatoes, we should serve them over pasta with some extra parmesan. The tomatoes will release some liquid when you cut them open, and it’s such a shame to waste any saucy goodness that spills out of them! Why not soak it up with some penne or spaghetti? Honestly, I always thought succotash was a nonsense word made up by Sylvester. 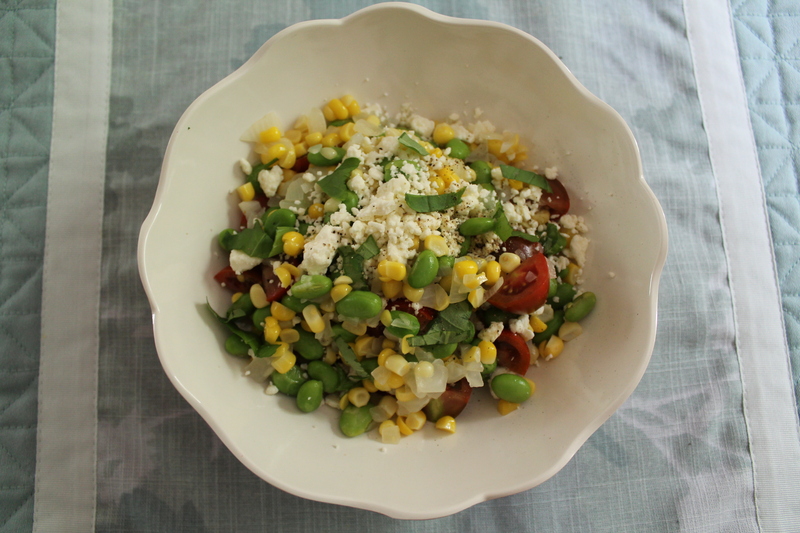 But, as it turns out, it is a much misaligned but intensely delicious corn and bean salad! When corn came into season, I decided pretty quickly that I needed to give succotash a try. But much to my dismay, most of the highly rated recipes around the web are so because they include bacon! Boo. So how excited was I when Sarah of Well Dined tracked down a great recipe that highlights the fresh veggies with feta and basil? Yum! Seriously, you have to make this! Corn is beautiful and sweet this summer, cherry tomatoes and basil are abounding in farmer’s markets and grocery stores everywhere…You will be sneaking spoonfuls of this from the stovetop, the serving bowl, and the fridge. And lo and behold, I also got a poblano in my box this week (along with several ears of corn, a watermelon, potatoes, grapes, several beautiful tomatoes, and a cucumber). 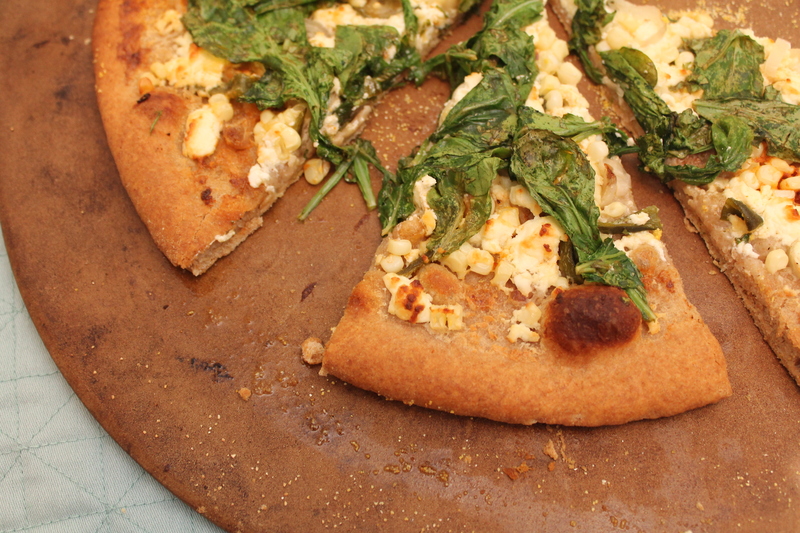 It was a perfect storm of amazing, because I have been waiting to share this pizza recipe with you all summer. I could make this again and again. And if you are your tastebuds are chummy, then so will you! Ever since I’ve known him, my husband has been on a quest for the perfect churro. You see, his family spent two weeks in Spain when he was a teenager, and Dave stuffed himself with churros for breakfast every morning. He keeps telling me that churros are one of his favorite things, but every time he orders them in a restaurant, he is completely disappointed. All he wants is the churros of his childhood, which were apparently soft and bready with an intensely chocolate dipping sauce. But here in the U.S., most restaurants serve up the same hard, crunchy churro and mild, powdered hot chocolate—not at all what Dave has in mind. So when Secret Recipe Club time rolled around again, I was excited to see that Jennifer from Peanut Butter and Peppers had posted a recipe for baked churros! Dave was so happy he did a cheer. 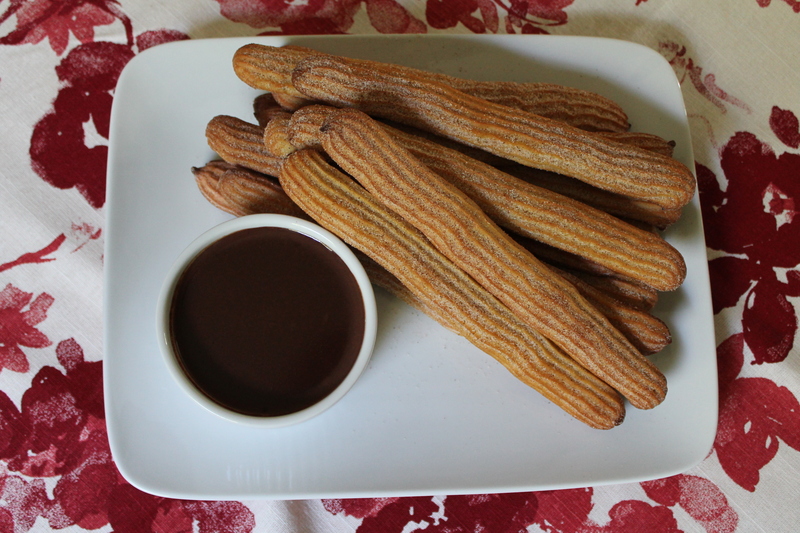 So will you, when you realize how easy it is to make churros and hot chocolate right at home! These babies turned out soft on the inside, crisp on the outside, with a great cinnamon coating. I added a bittersweet chocolate dipping sauce, and we were transported to Spain. The first time I ever had gazpacho, it was more like a mealy pureed tomato than soup. I decided gazpacho wasn’t worth my time and promptly forgot about it. But last week, with three cucumbers and one beefsteak tomato in the same CSA box, I got to thinking. When three more tomatoes and a bell pepper arrived this week, I knew I should probably give gazpacho another try. 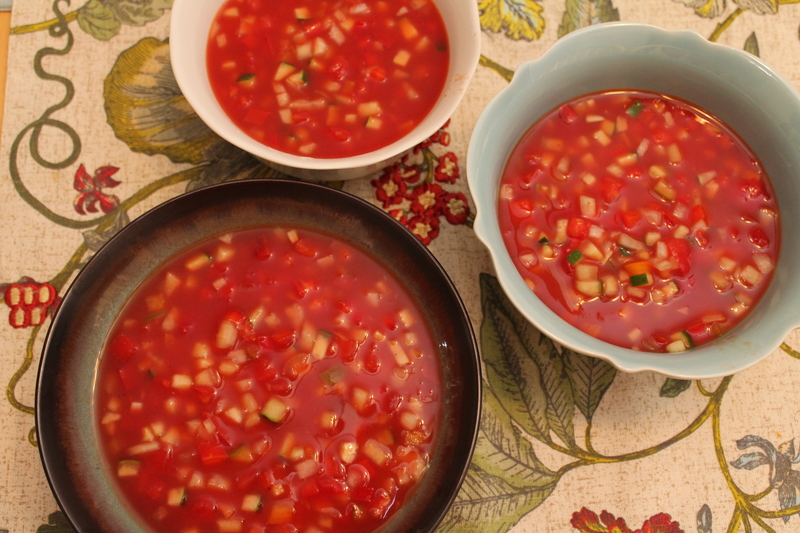 I consulted my trusty New Best Recipe and read that the best versions of gazpacho aren’t pureed at all, but instead are full of finely diced veggies swimming in tomato broth. I made my peace with the two hours it would probably take me to dice that many veggies, and the resulting gazpacho was delicious! In Spain, they call it liquid salad…it looks and smells of high summer, and is the perfect end to a sweltering day! I guess I owe you an apology. You were right. There is a place for cucumbers in my life. Like in tzatziki. And gazpacho. 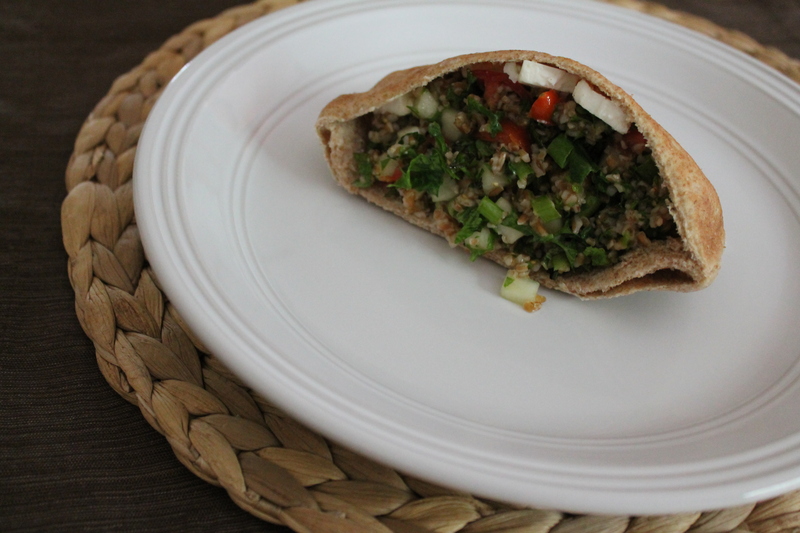 And tabbouleh, which I also hated prior to this summer. We have an uneasy friendship, don’t we, CSA share? For weeks, I’ve wanted to stop being bombarded by cucumbers and just get onto the tomatoes and corn and peppers already. But I must admit…you probably knew best. You have forced me to try new things, things I never would have considered if the top shelf of the fridge wasn’t buckling under the weight of all those cukes. So…sorry for badmouthing you behind your back. 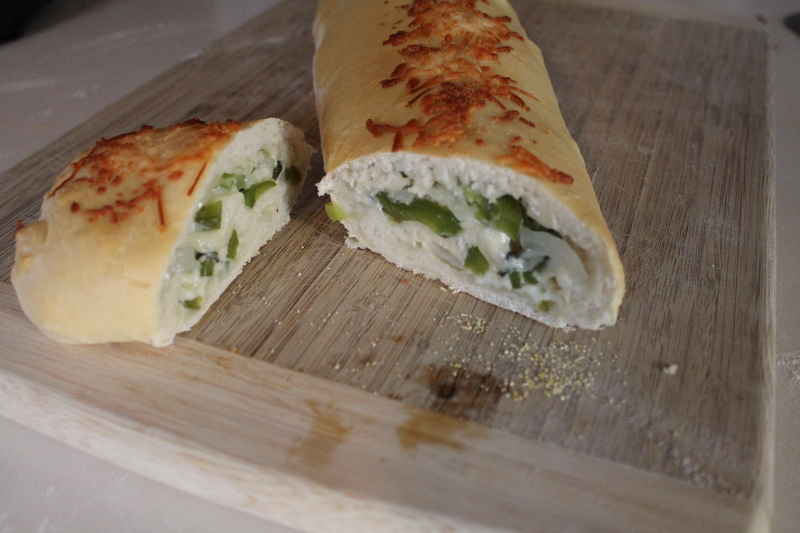 Here’s one final cucumber recipe…take it as a peace offering.